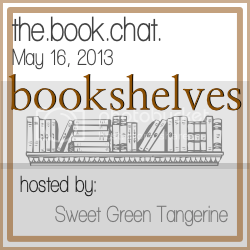 This week's book chat is about book shelves. As usual, I'm linking up with Jessica at Sweet Green Tangerine for the book chat. I put most of my books into storage when I moved here because I simply had no idea what kind of space I'd be moving to and I didn't want to end up with a bunch of stuff and nowhere to put it. Plus, I don't keep every single book I've ever read like I used to anymore (they go up on paperbackswap.com now) so my current book shelf is a little sparse. Hey Mom...I'm in need of a Flyers Potato Head! I don't have (do...I don't know what the correct verb is) Pinterest so I don't have pictures of dream book shelves. I do know that when I build my little eco-house (with the gray-water system and the solar panels) on my little homestead there will be a room dedicated to books. I can picture it in my head. There will be comfy places to sit and lots of natural light (through reclaimed windows, of course) and the walls will be lined with books (on shelves made from reclaimed wood, of course). It doesn't have to be a very large room but it does have to exist. I like your current shelf! It's eclectic and creative.